Anyone have any decent results with ribs? I generally like to eat everything edible but I haven't had good results with ribs, no matter what method I use I haven't been able to avoid that pasty texture. Anyone have any tips? I see I'm not the only one who likes the idea of eating venison ribs. Those who have not tried them are missing out big time. They are delicious. I found this recipe on Facebook and it said it was free to share. I cooked them this way twice and they turned out great each time. When you take your deer to the processor you must tell them that you do in fact want the ribs or you won't get them. I would recommend you buy one of those disposable black pepper grinders if you don't have one. I added a little more than the recipe and they were great. The grape shiraz is the same as the French syrah. Shiraz is how it's spelled in Australia and Syrah is how it's spelled in France. It's still the same grape. Salt and pepper and any other spiced you might like. •Rub the racks with the spices evenly and set aside. •Heat a medium sized skillet with the olive oil and sear the racks until golden brown. •Keep the pan with the juices. 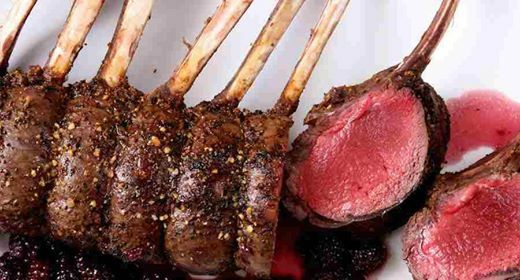 •Remove the racks to a baking tray and bake in the oven for 5 minutes for medium rare. •In a small sauce pan with the olive oil, sauté the onions and peppercorns until onions are caramelized. •Add the Shiraz and reduce by half. •Add the broth and reduce by ¾ volume. •Add the cornstarch and thicken to make a roux or slurry and simmer for 1 minute. •Whisk in the butter and season to taste with salt and pepper. Enjoy! That recipe sounds good, thank you. I hate the thought of wasting anything edible from the animals I kill. There are a few parts I don't eat, but those my dog gets. My favorite way to cook venison ribs is over a campfire. Seasoned with salt, pepper and garlic powder. I prop them up on their side and turn them halfway through the cooking. Simple and delicious. I like them seasoned like I said above and cooked in the oven too, but they've always tasted better in camp. I also like to season them like I said above and fry them in a little oil til brown and a little crispy on the outside. Once in a while I'll do them in the crockpot. I cover them with a can of crushed tomatoes, add a chopped onion and green pepper. A clove or two of finely chopped garlic, sliced mushrooms, salt, and lots of black pepper. I like to put the sauce on egg noodles and eat it along with the ribs. Any way I make them, I like to eat them smokin' hot and keep the rest hot too. I don't notice any pasty texture that way. Thanks for the tips guys. I've tried them a bunch of ways, and I process myself so I always try and use every last scrap. I talked to a butcher and he told me venison fat spoils quickly when exposed to air, I hang my deer for 7-10 days before butchering. So I think the fat in the ribs has been turning on me by the time I butcher. The meat tastes fantastic but the fat doesn't benefit. I think next year I will be taking the rib cages off immediately and eating it with all the other parts that don't freeze well. I pressure cook them for 30 minutes, put a little olive oil on them and a good rib rub or BBQ sauce, throw them on grill (charcoal) with plenty of hickory and cook them until dark brown. Mighty good! I prefer to use a charcoal grill myself too but I can tell you that pressure cooking them certainly does make them even more 'falling off the bone' tender. I've gotta get a pressure cooker one of these days. I like a crock pot, but I have friends that use pressure cookers, and they can do in 45 minutes what it takes me all day to do in the crock pot. thanks. Throw them in a crock pot with water a few beef bulion cubes and a stick of butter. cook until they fall off the bone. Drain them (save the stock and bones for vegetable soup), shred them with a fork. Back in the crock pot with a cup of water and a stick of butter on low until the butter is melted. Stir. add your favorite bar-b-q sauce and serve on a roll or over a baked potato. Instead of bbq you can put it on a piece of Texas toast or a pile of mashed potatoes with a good brown gravy. Both are very good. Lately I've been lazy and just cut them up and ground them for burger. Deer is my families favorite meat and we eat it a couple times a week through out the year so burger gets the nod because its so versatile. Ok so I started this thread a while ago but I've cooked a few racks since then and have had some really good results! I've been marinating overnight in stubs beef marinade, but any marinade for beef will likely work fine. Then i put the ribs and the marinade plus a beer in a roasting pan and cover with foil and put in a 275 oven for 3-4 hours until the ribs are fork tender but not falling apart, take them out of the oven and let cool in the pan with the juices. When cool they will have tightened up a bit. Then I've been grilling over a hot fire to heat up and put a char on them....I reduce the cooking liquid and add some ketchup and sugar to make a BBQ sauce and brush the ribs before they go on the grill and once during....only takes a few minutes and they're good to go!